Three puppies were born January 19, 2017. Black/White and Blue Merles with tan or brindle points expected. Puppies will be PRA Clear. They will be clear or carriers of DM , Pink and Fluff. All puppies have gone to their new homes. Puppies will be DM Clear, PRA Clear, Pink Normal, and Fluff Carriers. 3 blue boys, 3 black boys and 1 black girl. Puppies will be DM clear. We are expecting black and blue with brindle points with a possibilty for tan points. Puppies were born on April 22, 2012! Three boys and 4 girls. Ebonwald A Minnesota Blessing CGC RE STDs "Minnie"
CH Tailbrite Dark Before Dawn "Crescent"
Crescent is a handsome dog with a fantastic pedigree, beautiful movement, bone, beautiful prosternum, short parallel pasterns and long upper arm among other virtues. We are very excited about this litter. 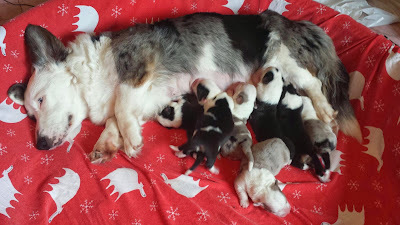 Colors will include black and white with brindle or tan points and blue merle with brindle or tan points.